The 7th International Conference on Ecosystems and Sustainable Development (ECOSUD) took place recently in Chianciano Terme, Tuscany, organised by the University of Siena., Italy, and the Wessex Institute of Technology, UK. The co-organisers and co-editors of the book were Professors Enzo Tiezzi and Carlos Brebbia. The editors explained in the preface to the book that the root of the acronym ECOSUD is the Greek work ‘oikos’ meaning house. House, our common house, is nothing but our planet – the only one we have – with all its resources, services, goods and functions that make life possible. The same Greek word is also the root of two academic disciplines dealing with ‘house’ One the one hand we have ecology, as the sum of ‘oikos’ and ‘logos’ meaning the study of the house; on the other we have economics, as the sum of ‘oikos’ and ‘nomos’ meaning the management of the house. The relationship between economics and ecology is just starting to be acknowledged. In fact, environmental deterioration and dissipation of resources continue to penalise social development. The gap between poor and rich countries and the scarcity of resources points in the direction of unacceptable inequities and increased possibility of armed conflicts. In particular, the quality of our existence depends on the quality of our land (nature, towns and country) and the quality of human activities that it hosts. Any attack upon this quality, to the advantage of a few and the detriment of others is unacceptable, even if motivated by allegedly inexorable economic necessity (the “law of the market”, competition and the like). In the long term, the destruction of natural resources and the environment does not pay in economic or social terms. In a few words, it is not sustainable. Nowadays we strongly need an improvement in communication between disciplines, moving from specialisation and juxtaposition to cooperation, coordination and finally what today is called transdisciplinarity or ‘cross-fertilisation’. Besides giving rise to major scientific innovation, transdisciplinary approaches have practical implications, especially for the study of environmental dynamics in relation to human activity. 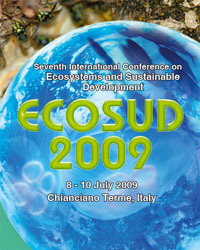 ECOSUD 2009 offers a unique opportunity and encourages transdisciplinary communication between scientists, engineers and professionals working in ecological systems and sustainable development. The conference objectives have evolved over the years, seeking to investigate thermodynamics, ecology and economics: ‘ecodynamics’. Professor Brebbia then explained the importance of transdisciplinary activities at the Wessex Institute of Technology (WIT) which collaborates with many different partners from all over the world, some of them in humanities, politics and economics, in addition to those involved in physical sciences research. This interaction, Professor Brebbia said, is essential to finding solutions for the many problems affecting our society. WIT is well positioned to act as a mechanism for the interchange of knowledge between many different disciplines. This function, Professor Brebbia explained, is the main strength of WIT and has led to its evolution and change since the institute was founded a quarter of a century ago. The meeting was also opened by Professor Simone Bastianoni from the University of Siena who referred to the work of Professor Enzo Tiezzi and the importance of Professor Ilya Prigogine for their research work. The ceremony to award the 2009 Prigogine Gold Medal took place in the Aula Magna at the University of Siena where the Rector, Professor Silvano Focardi called the congregation for the special occasion. The congregation entered the Aula Magna, preceded by the City Heralds and with the Rector and Professor CA Brebbia, Director of WIT, following. "I would like to extend my warmest welcome to the local authorities, the Principal of Wessex Institute of Technology, Professor Carlos Brebbia; Professor Emilio Del Giudice, my colleagues and everyone that has joined us today." "I am truly delighted to be part of this ceremony to award the Prigogine Medal to Professor Emilio Del Giudice. I would like to thank Professor Carlos Brebbia, the Principal of Wessex Institute of Technology, for being here with us today, as well as everyone present and all those who have contributed to the organisation of this event." “This occasion gives me particular satisfaction for various reasons." "The Prigogine Award was established in 2004 by our University, together with the Wessex Institute of Technology, in honour and in memory of Professor Ilya Prigogine, a Nobel Prize Winner for Chemistry. I am therefore proud to see the Prigogine gold medal return to Siena this year, after having been awarded by the Universities of Cadiz, Tartu, Coimbra and Thessaly. This is a sign of the appreciation that both scholars and institutions have for our historic university." "The Prigogine gold medal was first awarded in this room in 2004, to Professor Sven Jørgensen of the University of Copenhagen, who is here with us today and whom I am pleased to welcome." "It also gives me great pleasure that the recipient of the 2009 Prigogine Award is Professor Emilio Del Giudice, an Italian scientist of international renown, who is a member of the International Institute of Biophysics in Neuss, Germany, and a retired researcher of the Italian National Institute of Nuclear Physics in Milan." "This is a fitting recognition for an Italian scholar who has distinguished himself in his “clarity and intellectual honesty” – qualities that Prigogine deemed to be fundamental in a scholar – and in his work on the study of water and the memory of water, the dangers of electrosmog and electromagnetic fields, and on cold fusion and Quantum Electrodynamics. A scientist of international reput and the author of numerous international publications, Professor Del Giudice is better known in the scientific community than by the general public, partly because of the complex nature of his research, which is performed on a level apart from our daily lives and even from the immediate scientific world." "I hope that this prize can contribute to making Professor Del Giudice’s work and the results of his research more widely known, thus satisfying the strong desire of Ilya Prigogine to make even complex knowledge accessible to all and to spread the passion for knowledge." Professor Brebbia then explained the motivation behind the establishment of the Prigogine Medal and the background of previous recipients. Professor Prigogine, among other activities, was Honorary Chairman of the ECOSUD Conference. The recipient of the first medal in 2004 was Professor Sven Jørgensen of the Danish University of Pharmaceutical Sciences. He is well known for this work in Ecology, particularly in systems modelling, ecological engineering, environmental sciences and environmental management of aquatic systems. Professor Jørgensen serves on many important committees and as editor of many scientific publications. He has published many scientific papers and books. 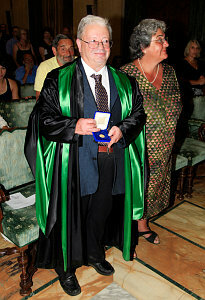 Professor Enzo Tiezzi received the 2005 medal at the University of Cádiz. Professor Tiezzi studied at the University of Florence where he developed an interest in the then novel field of magnetic resonance and worked on the first NMR prototype machine built at that University. He won a Fullbright Scholarship to Washington University, where he continued working on NMR under Professor Sam Weissman of the Physics Department and Professor Barry Commoner of the Department of Biology. This collaboration resulted in several seminar papers on pioneering development of NMR. Professor Tiezzi is Full Professor of Physical Chemistry at the University of Siena. His outstanding scientific career has been matched by a strong involvement in environmental and social issues, reflecting his deepening commitment to ecology and Prigogine’s ideas. Professor Tiezzi, in addition to numerous papers, has published more than 20 books dealing with scientific topics, as well as humanities and poetry. Bernard Patten, recipient of the 2006 medal, is Regent Professor of Ecology at the University of Georgia in the USA. He is a Systems Ecologist and Ecological Modeller interested in the applications of mathematical theory to ecosystems. He formulated a well known environmental theory called “environ theory and analysis” that permits the use of network mathematics to represent and analyse ecosystem networks. Professor Patten’s publications include many papers on a variety of ecological topics especially main fresh water and wetlands ecosystems. Robert Ulanowicz, recipient of the 2007 medal is Professor at the University of Maryland, at the Chesapeake Biological Laboratory. He is a Chemical Engineer by training who specialised in Ecosystems Theory with outstanding results in the field of Complex Ecology. His scientific contributions are renowned in Network Analysis, Information Theory in Ecology, Thermodynamics in Ecology and Causality in Evolving Systems. Another area of interest for Professor Ulanowicz is the dialogue between science and religion. Professor Ulanowicz has published many scientific papers in international journals, and several books. Professor Ioannis Antoniou, recipient of the 2008 Award, is Professor of Analysis and Statistics and Head of the School of Mathematics at the Aristotle University of Thessalonica. He graduated from the Physics Department of the University of Athens. After graduation he worked in the Greek Ministry of the Environment on atmospheric pollution measurements and statistical analysis and went to Brussels for his PhD research where Ilya Prigogine was one of his PhD advisors. His doctorate thesis on Relativistic Chaos and Probabilistic Analysis of Complex Systems was the beginning of a fruitful collaboration and friendship with Ilya Prigogine. Professor Antoniou’s work was carried out at the International Solvay Institutes of Physics and Chemistry from 1982 till the passing away of Ilya Prigogine in May 2003. He was then appointed Deputy Director of the Solvay Institutes in 1994 where he stayed until 2004 when he returned to Greece. The 2009 Prigogine Medal will be awarded to Professor Emilio Del Giudice, currently member of the International Institute of Biophysics at Neuss in Germany. Professor Del Giudice previously worked at the National Institute of Nuclear Physics in Milano as well as the University of Naples, MIT, CERN and the Niels Böhr Institute. 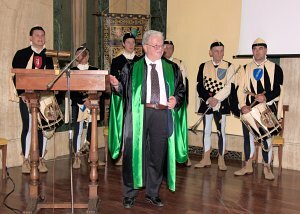 Following Professor Tiezzi’s remarks, the Heralds of the City of Siena blew on their medieval trumpets calling attention to the next part of the ceremony, which was the awarding of the Prigogine Gold Medal by Professor Brebbia to Professor Del Giudice. He referred first to the spirit of scientific curiosity that makes us investigate how nature works by decomposing its products into a series of basic elements. Once a living system has been divided into these elements down to the atomic or molecular level, the next question is to investigate how the system can be rebuilt again. This is indeed the challenge – according to Professor Del Giudice – of modern science. How can all individual components be made to evolve in the right direction and become say a living organism? There ought to be a code by which the atoms are made to fulfil their biochemical functions. Atoms interact in a purely random way in physical systems but not in the case of biological systems. In living organisms the atoms are arranged in accordance with a coding. This coding is based on electromagnetic fields, and the frequency of these fields made the interaction of different atoms possible. These forces are the basis of selection and the medium that supports this field is water. The next question is how the electromagnetic field can vary in water and how water can produce those variations? The answer is nothing short of a Quantum Physics miracle! The change in configuration is produced by exciting the atoms by photons which are ‘trapped’ in the system. The capture of successive numbers of photons will contribute to the oscillation of the atoms, resulting in the creation of a field that will attract other atoms. This means that water as an electromagnetic field can be seen as the source of all life. The lecture by Professor Del Giudice was followed with great interest by the audience who appreciated the importance of his work. Professor Brebbia then proceeded to give the Prigogine Medal to Professor Del Giudice in the name of the Committee. The ceremony ended with the Heralds blowing their call again and the Academic Procession leaving the room. The end of the ceremony indicated the start of a special session which also took place in the Aula Magna, comprising the delivery of two special papers by the Prigogine awardees, Professor S Jørgensen (2004) and Professor E Tiezzi (2005). Professor Jørgensen’s talk concentrated on “The Role of Wetlands” while Professor Tiezzi’s was on “Global Warming Potential Revisited”. Both lectures were followed with great interest by the audience. 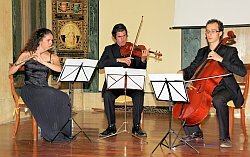 The Aula Magna events ended with a concert by a trio – cello, violin and flute – which played pieces by Mozart and Bach. Leaving the Aula Magna, the delegates were invited to visit a museum in Professor Tiezzi’s contrada called “La Giraffa”, which illustrates its participation in the ancient palio. 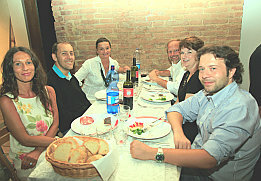 This was followed by a dinner in the same contrada. 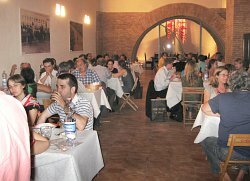 The dinner was characterised by a very friendly atmosphere and the delegates were delighted to have seen a part of Siena life which is usually not seen by other visitors. The Conference will be reconvened in 2011, the date and location to be decided shortly. Papers from the conference will also be hosted online at the WIT eLibrary as Volume 122 of WIT Transactions on Ecology and the Environment (On-line ISSN: 1743-3541). For more details visit the WIT eLibrary at www.witpress.com.